This app is a good way to start your kids reading. The pictures are simple and clear and it's something that can grow with your child. One of my sons (4yr) is filling in the letters and my other son (2yr) is saying the words even though he is nowhere near being able to read yet. Good app. 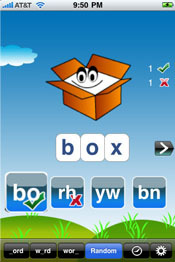 Word Magic is designed keeping preschooler and kindergarten kids in mind. It is very ideal for kids between the ages 3 to 6. 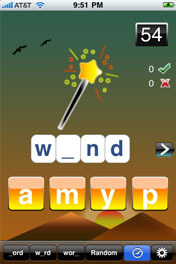 It is an excellent application for kids to have fun with words and their spellings. 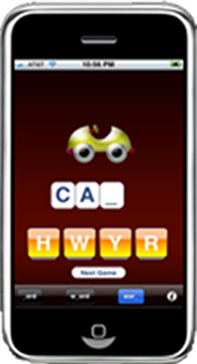 Word Magic is very ideal for parents since it engages kids while driving, in the airport or while waiting in the restaurants. Very simple design. Kids need to just touch the answer. Very attractive and funny pictures. Once they identify the correct answer, shaking the iphone will take them to a new problem. After every 5 successive correct answers different colored stars appear as their rewards. Kids love this.